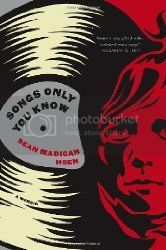 Sean Madigan Hoen stopped by Schuler Books earlier today to promote the release of his new memoir, Songs Only You Know. I was unfamiliar with Hoen, but events coordinator at Schuler, my friend Whitney, talked me into coming to the event, and I'm glad that I did. It may not have normally been the type of book that I would have read (the memoir is about Hoen's time in the punk rock scene in Detroit in his teens), but I think that I'm going to find the book fascinating. 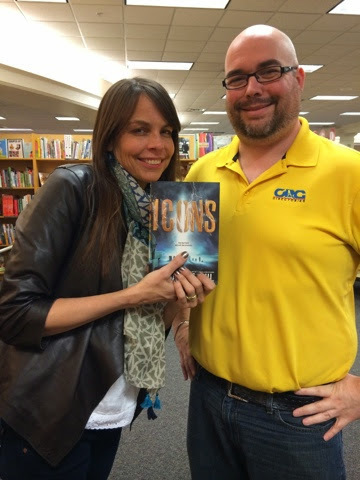 Margaret Stohl stopped by Schuler Books last night to promote the paperback release of her book, Icons. I'm going to admit up front that I haven't read anything by Margaret Stohl before, but the woman totally impressed me last night. She gave great advice for people who are scared to take that chance that they've always wanted to take (just take the chance! ), great advice for writers, and great stories to tell of experiences in her life. At the end of the night, she bought copies of her own book from the store to donate to local high schools and signed them all! I thought that was a pretty awesome thing to do, and yet one more reason why I will always stand behind the idea that all authors are superstars! 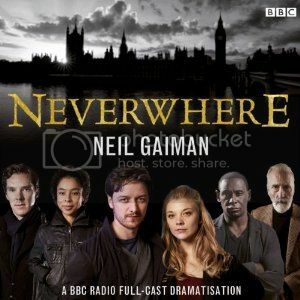 I just finished listening to BBC Radio's production of Neil Gaiman's Neverwhere, and it was a wonderful thing. It took me a little bit to get used to the way the production was handled, but eventually I was swept up in the story and had no problems following along. The narrators are fantastic, including James McAvoy (LOVE), Natalie Dormer, David Harewood, Sophie Okonedo, Benedict Cumberbatch (LOVE, AGAIN), Christopher Lee, Anthony Head, David Schofield, Bernard Cribbens, Romola Garai, George Harris, Andrew Sachs, Lucy Cohu, Johnny Vegas, Paul Chequer, Don Gilet, Abdul Salis, and Neil Gaiman. I've never read Neverwhere before, and when I heard that they released the BBC production on Audible, I jumped at the chance to download it. While I had part of the story figured out rather early on, I still enjoyed it. Gaiman has such a way of making something that shouldn't feel real at all seem absolutely ordinary and matter of fact. 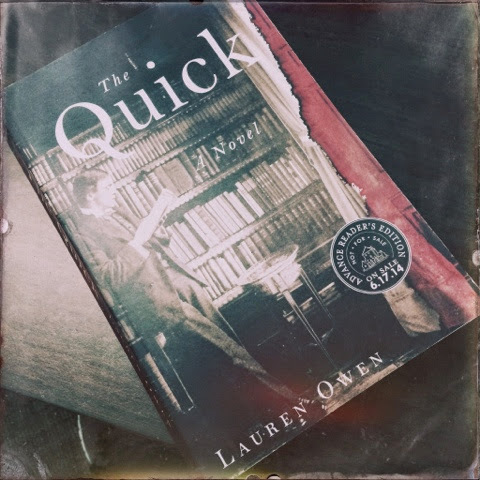 I've got a copy of the novel at home, and I think I'm going to pick that up sooner than later to see how the book plays out and to see if they kept honest to the book or made any drastic changes. 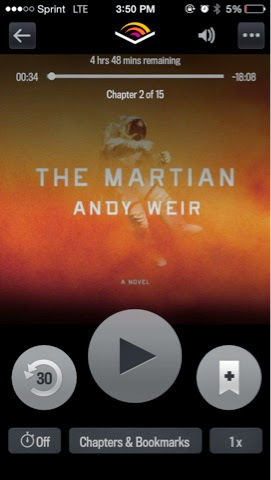 If you enjoy audiobooks or audio dramatizations, I'd highly recommend this! It was a topnotch production. 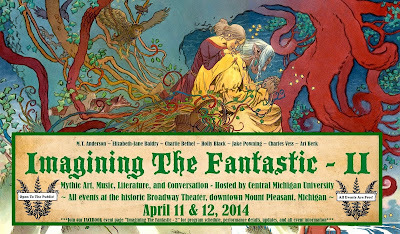 This past weekend, Sarah and I attended a free academic(ish) conference on fantasy and the fantastic in art, literature, music, etc., called Imagining the Fantastic - 2 (this was the second such conference, the first was held in 2011). I'll admit, my main draw to this conference at first was getting the chance to finally meet Charles Vess, Sarah was quite excited about the discussions that were being held at the conference, so we decided to make a weekend of it instead of just going over for one day, and I'm so glad that we did! The featured speakers, seated from left to right: M.T. Anderson, Holly Black, Jake Powning, Charlie Bethel, Charles Vess (! ), Elizabeth-Jane Baldry, and Ari Berk (who put the entire event together in conjunction with Central Michigan University). There were several panels in which all the participants took part in, and then there separate panels for Charles Vess to discuss his artwork (the man produces just gorgeous artwork), and then another for Jake Powning to discuss his swordsmith techniques (which turned out to be one of the most fascinating discussions of the entire weekend). Some of the other panels that everyone took part in dealt with where the ideas for the fantastic come from; do artists/authors need a little bit of madness in their lives to create; music and the fantastic; and at what point would something be too dark for the creators to actually stop creating something. I honestly wasn't sure how I was going to feel about each of these panels, but honestly I found myself enthralled by the entire thing. Friday afternoon, there was an hour set aside for the authors to sign books, and every one of them was willing to sign anything that was brought to the theater - which I'm very grateful for, as I had quite the stack of book for Charles Vess to sign! The local bookstore even had copies of some of their books for sale, in case you wanted to pick up something extra at the event. Friday night Charlie Bethel performed his one man production of Gilgamesh, and Saturday evening, Elizabeth-Jane Baldry performed live on the harp the score she had composed for the 1924 silent film version of Peter Pan, which was beautiful! Sarah and I both thoroughly enjoyed ourselves this weekend, and I'm hoping that there will be future conferences and that they are just as educational as this one was. I guess this was supposed to be the flagship title for the Marvel NOW initiative? It was the first on-going title to be released post-AvX, an amalgamation of Avengers and X-Men characters merged into one team (because, what spells more money for Marvel these days than the Avengers and the X-Men?). Anyway, I more or less ignored it, for what reason I'm all not that sure (I'm sure it had something to do with the fact that they've got Wolverine in yet another book - seriously, if there is one character in the Marvel universe that is overused, it's Wolverine). Anyway, I'd been reading the Marvel NOW X-Men titles, and really enjoying those, and then I jumped ahead a little and read Infinity, and holy crap, that impressed the hell out of me, so I thought maybe I needed to backtrack a little and pick up the Avengers collections as well. Figuring I should just start from the beginning, I went ahead and started with Uncanny Avengers. Meanwhile, Scarlet Witch comes to pay her respects at the grave of Professor X, and Rogue shows up and they fight because Rogue is pissed with Scarlet Witch over the whole House of M mess. Suddenly, a whole slew of new villains show up and beat the crap out of Rogue and Scarlet Witch, take them prisoner, and take something Xavier's grave. Turns out, it was his body. The Red Skull is behind all of this (a frozen clone from the 1940s), and he wants Xavier's brain, to fuse it to his own so that he can steal Xavier's mind control powers and turn all the humans in the world (or at least NYC) against mutants and start a war against the humans and mutants. (Honestly, I'm not even quite sure why this is happening. They needed a villain, one that has ties to both the Avengers and the X-Men, so came up with this ridiculous idea of the Red Skull basically turning himself into a mutant, in order to cause the world to go mutant-hating crazy). Long story short, of course the good guys win and that's the end of the first three issue arc. The Red Skull falls next to a puddle of water (conveniently) and one of his minions (who I think is a mutant, so why he doesn't want to kill her is a little vague) can travel thru water, so she happens to be right in that particular puddle, and the Red Skull escapes. Convenient. I think maybe this story suffered from trying to rush too much story into too few issues. I think I would have like to see the build up of tensions between Captain America, Havok, and Wolverine about this new Avengers team over a little time, but instead we basically got the whole thing done in a few panels in the first issue (the Avalanche bit) and everyone was good to go. The next two issues in this volume deal with the Wasp (who I thought was dead) and Wonder Man (who I also thought was dead), showing up to be this new team's marketing department. Basically, it's their job to make the team likeable and look non-threatening, because mutants (including creating a line of clothing based on their costumes - really?). They plan a press conference to show the world how nonthreatening mutants are, and if the Avengers will have them on the team, then of course they can't be bad at all. Cue the Grim Reaper popping up out of the crowd of journalists (I mean, seriously - nobody saw a guy standing in this crowd, in a black costume with a cape, giant pointy things come off of his head, and a FREAKING GINORMOUS SCYTHE FOR A HAND?! Seriously?!) and screaming something about being pissed with Scarlet Witch for bringing him back from the dead and him not being able to die. (When did all of these people come back from the dead? Death must be pretty pissed that she can't seem to keep a handle on everybody who's kicked the bucket in the Marvel Universe. Just saying.) He beats the crap out of everybody, except Rogue who borrows Wonder Man's powers and punches the Grim Reaper and apparently kills him (so much for him claiming to be unable to die two panels earlier). So, naturally, now it still looks like mutants can't be trusted with their own powers. And that's the end of the volume. So... there's probably plenty of other stuff that went on in this issue that I'm not recalling, but I think it's pretty clear I was underwhelmed with the whole thing. It could be that I don't really follow the Avengers comics, so don't really know essential background info that would help make sense of all of this, but then I think about Infinity, and how that story tied in a whole lot more than what this volume did, and I could follow that and was kept intrigued by what was going on, maybe it just really was the writing for me. I don't know that I've experienced a lot of Remender's writing before, and I know a lot of people like his stuff, but I felt there was too much rushing going on, and too many convenient events going on than was necessary. It was just way too forced and rushed for my liking. The art was great, however. John Cassaday and Olivier Coipel are up to their usual best (Coipel has really been becoming a favorite of mine over the years), so there are no complaints there. 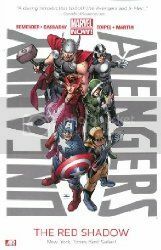 I'll probably be picking up the next volume eventually, as I'm interested in how this ties in with the future Avengers series to build up to Infinity, but I think I'm going to looking out for the other Avengers titles first, and get back to this series when I've run out of the other series to read. J. A. White's The Thickety: A Path Begins is an unexpected surprise for me. I generally avoid reading middle grade, as I'm usually annoyed by authors who pander to a younger audience and tend to make a book too simplistic for that very reason. I think this was why as a kid, I graduated myself fairly early on from books geared toward young readers. Even at that age, they annoyed me. The prologue opens with a young Kara being kidnapped from her home and being accused, along with her mother, of being a witch. While Kara is able to convince the townsfolk of her innocence, it is too late for her mother. Skip ahead several years, Kara's father has fallen into a deep depression and her young brother is often sickly, so it falls to Kara to take care of her family and make sure that they are as well provided for as she can manage at such a young age. Kara and her young brother Taff are shunned by the townsfolk, as they fear that possibly Kara might follow in her mother's footsteps, as magic is the ultimate evil according the townsfolk. The epitome of this truth is the dark forest, the Thickety, that is ever encroaching on their village. Filled with creatures and evils, the town lives in constant fear of the Thickety, since being on an island only gives them so much space to share with the forest, so there is a constant battle to keep the forest from growing any further. (Clearers work day in and day out, clearing the new growth that is constantly sprouting as the forest constantly marches forward.) Everyone knows that you stay away from the Thickety, because if you are lucky enough to escape if you do enter, you are never the same again. Kara knows this, but when she is lured into the forest by a strange bird and led to a book that belonged to her mother, she begins to question everything she's ever been taught about her family, magic, and her place in the world. I think what surprised me the most in The Thickety was the fact that bad things did happen to people, and you had to learn that life went on. Kara's life seems to be one unfortunate event after another, but she's learned to persevere and take the best that she can out of life. 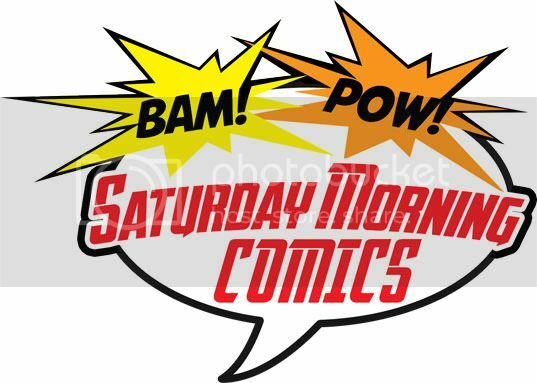 Other issues that are handled in the story, and not necessarily in a candy-coated way either: death, depression, addiction, bullying, poverty, slavery. Honestly, I forgot I was reading something that was being marketed as middle grade; I felt that what I was reading was something a little stronger than what I imagine most middle grade books being. White certainly doesn't pander to a younger audience, and this is a good thing. Another aspect of the book that I liked is there is no clear time frame for when this story is taking place. The villagers attitude towards witches and magic is certainly reminiscent of the witch hysteria of the late 1600s/early 1700s, but the island is so isolated, I kept getting the feeling that possibly the world outside had been progressing along while the community on the island remained stagnant. (I couldn't help but think of M. Night Shyamalan's movie The Village while reading.) Of course, this could never be explained, and the time frame is left up to the reader's imagination, but either way, I liked the fact that there is nothing set in stone here about a time, that it is just happening in the course of things. 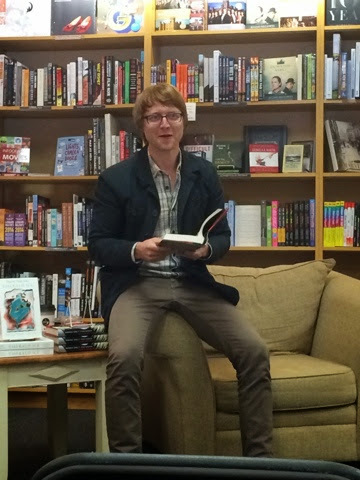 For a debut novel, J. A. White certainly has a home run with this book. 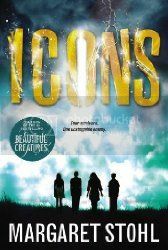 His descriptions are excellent, his creatures are believable, the magic use in his world is unique, and his writing is very tight and spot on with the pacing, all the way up to the final twist (or two!) in the story, one that I did not see coming at all at first. I'm hoping that White will continue writing such compelling stories for years to come! 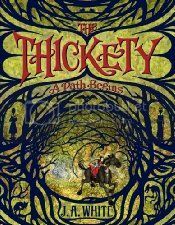 The Thickety: A Path Begins will be released by Katherine Tegen Books on May 6, 2014. 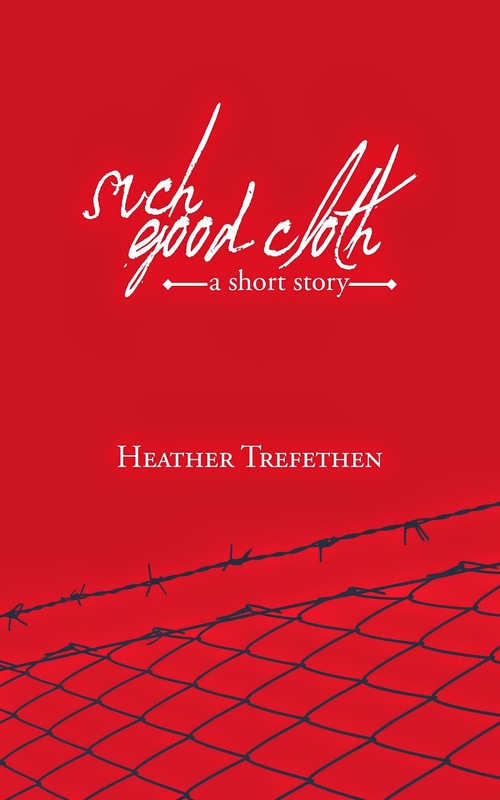 My cousin, Heather Trefethen, has released her second book, a short story titled Such Good Cloth. 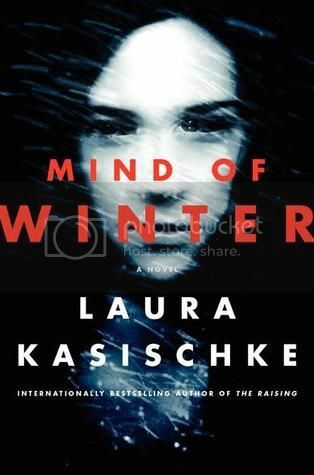 A short story set in Eastern Europe during WWII, Such Good Cloth chronicles events in the lives of three separate individuals experiencing the horror, fascination, and heartache of war. Kriska, using her vivid imagination to stave off her hunger pangs, wants to be an actress. Nicolaus, anticipating the arrival of “the great speaker”, wants to be a soldier. And Joseph, having just been liberated from a concentration camp, simply wants to be at peace. In their own way, the three must come to terms with what they are about to realize, what they failed to recognize, and what they never could have conceived. It's really quite a compelling story. Heather deals with some serious issues in a very few number of pages, and delivers an emotional punch with each one. I'm just so ridiculously proud of her! The book is available as a Kindle version , a Nook version, and a paperback edition . Please order a copy and give it a read. You won't be disappointed! 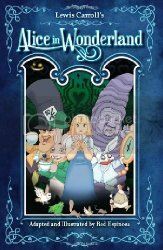 A cute adaptation of Alice in Wonderland that is more an amalgamation of the various popular versions than anything else, Rod Espinosa keeps to the original sense of the tale, while making it lighthearted enough for anyone to be able to enjoy. Some might say too lighthearted, but I'd like to think that possibly this version would open doors to readers unfamiliar with the Lewis Carroll original to give it a try. With his art style firmly grounded in a manga esthetic, Espinosa gives his own twist on each of the characters. While this mostly works, some of them are a little off for me (such as the Mad Hatter being a clear caricature of Jay Leno - why? ), while others are wildly original and unique (I love his Queen of Hearts!). All around, a fun adaptation of Alice in Wonderland and one that I'm sure will appeal to younger audiences.